Atlantis has a new, Asuran-constructed Zero Point Module to power the city, which replaces the nearly-depleted Z.P.M. used to flee the planet Lantea and keep the city alive in deep space. That original power unit is probably not quite fully depleted yet, but even with the new Z.P.M. the city does not have an abundance of power. The new Z.P.M. was severely taxed taking the city through hyperspace and landing on the new planet. Thanks to a bit of hacking from Rodney McKay, the team has managed to reactive the core command in the Replicators’ base code: to attack the Wraith relentlessly, as the Ancients originally created them to do (“Progeny”). Once the revised code was sent to the entire Asuran population during a collective update, they immediately launched a fleet of ships headed for a Wraith planet. The Replicators and the Wraith are going to war. It is not known, however, just why this command had been deactivated to begin with. It may explain why the Asurans claimed to have a plan to deal with the Wraith at a time of their choosing (“Progeny”) — but had gone at least 10,000 years beyond the Ancient-Wraith war without acting. It has been established, however, that the Asurans are incapable of altering their own base code (“Progeny”); thus Niam needed McKay to alter the part of their base code that made them fundamentally aggressive, in the hopes that doing so would allow them to ascend. It may be, then, that the Ancients themselves deactivated the imperative to attack the Wraith, for reasons that remain a mystery. In that case, reactivating it may have unforeseen consequences. It is also not outside the realm of possibility that the Wraith themselves found a way to alter the Replicators’ base code, to take them out of their fight against the Ancients thousands of years ago. This stratagem may have proved a significant turning point in that conflict. 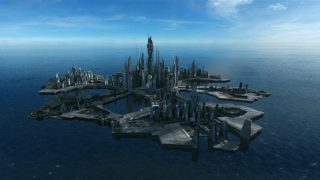 The city of Atlantis has a new home, having fled its original planet, Lantea, to escape the Replicator satellite weapon. The surface of the planet is mostly covered by ocean, though there are some land masses with indigenous plant and animal life (including a venomous snake). The planet has five moons. The city’s new home planet is apparently also closer to Asuras, the Replicator homeworld. It is now within range of Atlantis’s long-range sensors, allowing them to monitor activity such as the launch of Replicator warships. This is, of course, also a potential disadvantage to Atlantis should the Replicators ever discover where Atlantis is. Their own long-range sensors should be at least as powerful as Atlantis’s sensors. Elizabeth Weir is still alive, having been healed from her injuries by the Replicator nanites that are now keeping her alive. These nanites also allow her to access the Replicators’ collective, enabling her access to information and a measure of control over them. But she has been captured by the Replicators, and it is not clear just what they will do with her — if they will kill her, interrogate her, or try and convert her and use her to their own ends. The loss of Weir into the hands of the enemy is, at the very least, a major security breach for Atlantis and for Earth. Even though she does not know the location of Atlantis’s new home, even though passwords can be changed, the Replicators conceivably now have access to everything she knew: Earth and the Milky Way Galaxy, the Milky Way Replicators, planets visited by the team and other races encountered, Earth’s battle cruisers, the Midway Space Station, technological and tactical information, the anti-Replicator weapon and plans for a planet-wide version capable of wiping out a planet of Replicators, etc. Weir has a “kill switch” programmed for her nanites, though the first attempt to use it failed. The Replicators may also discover it and choose to deactivate it. With Elizabeth Weir lost, who will be assigned command of the Atlantis expedition? As the next most senior member (and the senior military officer on the base), temporary leadership falls to John Sheppard. But it no doubt won’t be long before the International Oversight Advisory assigns a replacement for Weir. Whether or not that person is military or civilian, and from the United States or a different I.O.A. member nation, may have a significant impact on the future of the expedition. Elizabeth Weir – Elizabeth Weir has been captured by the enemy. After being healed by Replicator nanites, she bravely joined the team on a daring mission to infiltrate the Replicator homeworld, steal a Zero Point Module, and alter the base code of the artificial lifeforms. She performed her duty grandly, using her new nanite connection to the Replicators to access their collective and guide the team safely to their objectives. When it became clear that Sheppard and Ronon would not make it out, she took the fight directly to Oberoth, leader of the Replicators, and with the strength of her mind froze all the attacking Replicators in place. She even tricked Oberoth into thinking the team had been caught, showing him a false scenario as he had done to her team before. Elizabeth sacrificed herself to allow the others to escape, returning to Atlantis with the new power source to save the city. She is now in the custody of the Replicators, her body being kept alive by their nanites, and her future disturbingly uncertain. Samantha Carter – After helping the Apollo locate the lost city of Atlantis and rescue Colonel Sheppard’s team, Sam Carter is preparing to return to Earth to report on the city’s situation to her superiors. She has recently been promoted to full-bird Colonel. Oberoth – The leader of the Replicators — who call themselves the Asurans — Oberoth has fallen victim to theft at the hands of the Atlantis team. But they have done much more than merely steal a single Z.P.M. — they have reactivated the Replicators’ base command to attack the Wraith. Oberoth may not even realize that he and his people are being manipulated in this way. Oberoth did secure one small victory from the ordeal, however: he has captured their leader, Elizabeth Weir. But now he must switch gears to becoming a military leader, as the Asurans are going to war with the Wraith. “As sad as McKay is to lose Weir, he sort of assumes that he’s the one who’s taking her place. And when Carter shows up it’s a huge shock to him. He’s like, ‘This is my base. I’m the pro here who answers the questions, not you.’ To top it off, all of a sudden this old life of McKay’s from his experiences with Sam and the SG-1 team has come up again, and it’s like hitting a window. He’s going along just fine and then, bang, Carter is in control. VOTE! How would you rate Atlantis's "Lifeline?"